Which styling do you prefer? I like them both (they make me feel calm) but I think the styling is better on the first image and I really love the Summery vibe of this blue San-Francisco map and the ceramic owl vase that holds paint brushes. What do you think? Which one would you choose for the catalogue? I would really appreciate your feedback on this….THANKS!! PS: The bottom photo with black masking tape was a gift from Christine Bernadet who writes the wonderful and funny Glouglou et Chou (on a winter blog break at the moment). I had these photos on a shelf in my lounge since she sent them to me last year and I’m super happy to be able to use them there. Yes 1st is my favourite too… quite realistic… anyway °°dreamistic°° (ca se dit?) 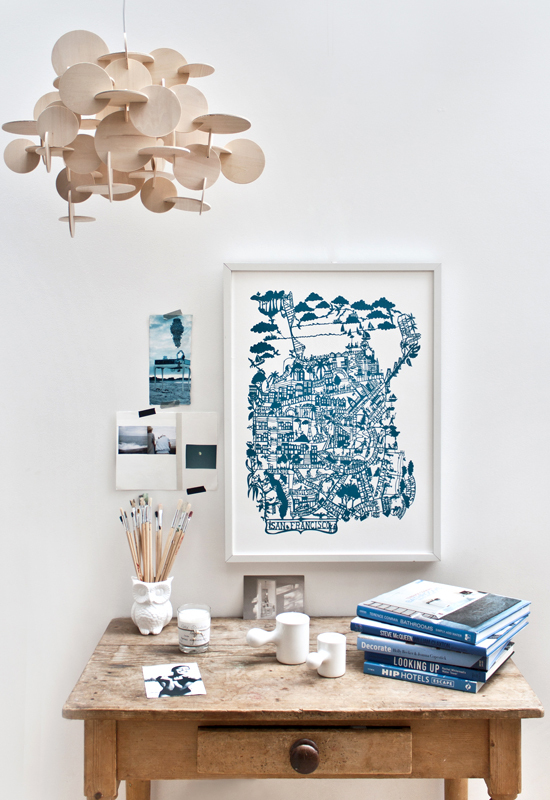 and inspiring… you want all… poster framed, pendant lamp, books, MT… and wooden table!! I like both very much but the second one highlights the lamp more. love the first… can’t wait to receive my SF poster!!!! I would definitely use the second one, I find it more balance and less crowded. But any of them would look equally good!! Et cette touche de bleu dans la 1e photo, j’adore! on the second the pendent stands out more. the map being colored & smack in the middle grabs your attention first on the first pic, then you see the pendent. i also feel like as lovely as those maps are they are always part of your shop, the pendent i don’t remember seeing so give it its limelight this time. Hi Karine,I’d choose first photo to the catalogue -i think that the blue poster creates a connection between the light and books.The second photo is a little bit empty without something in the middle.And oh,I love your blog! !